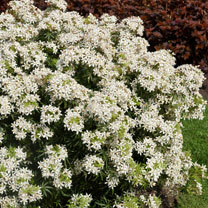 Richly scented white flowers in spring, and not uncommonly, a second flush of flowers in late summer and early autumn. These easy-to-grow shrubs boast glossy, evergreen foliage which provides structure and interest all year round. Height 1.5m (5'); spread 1.5m (5’).Supplied in a 3 litre pot.